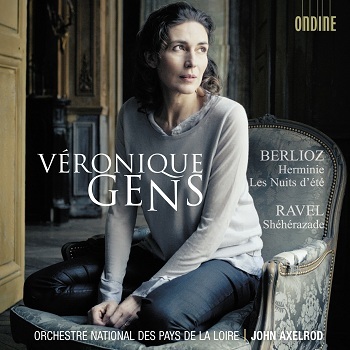 On this release famous soprano Véronique Gens performs Herminie and Les Nuits d'été by Hector Berlioz and Shéhérazade by Maurice Ravel with the Orchestre National des Pays de la Loire under the baton of its music director John Axelrod. Véronique Gens is internationally recognised as one of the greatest sopranos. She has made a big career with baroque repertoire and Mozart, but French repertoire, especially Berlioz and Ravel, are "as natural to her as the air that she breathes". Her French remains a model of immaculate diction, fluid and luminous. Having a very special relationship to Berlioz's Les Nuits d'été and Herminie, Véronique Gens combines them on this release with Shéhérazade by Ravel, which conjures up a totally different world. On this CD Herminie is released the first time with Véronique Gens. The charismatic conductor John Axelrod is music director of the Orchestre National des Pays de la Loire since 2009, following the philosophy of being "open to the world" by extraordinarily diverse repertoire choices and innovative programming. Also internationally he is a sought after conductor both for concerts and opera productions. Founded in 1971, the Orchestre National des Pays de la Loire, a "national" orchestra since 1996, is based in two cities, in Angers and Nantes. Today about 200 concerts attract yearly about 200,000 listeners, among them more than 10,000 subscribers.